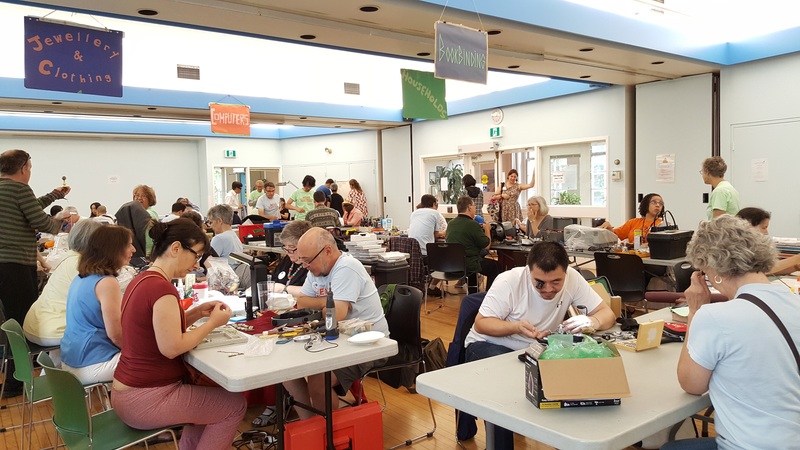 On Saturday, July 22, our Repair Café team returned to Ralph Thornton Community Centre at the foot of Don Valley Parkway. Our host, Judy Leung, the Branch Head of Queen/Saulter Branch of Toronto Public Library, greeted us with her staff when we arrived, and they assisted us with setting up the room. Before long, the room was filled with fixers and visitors and we started to hear the sound of the bell being rung indicating successful fixes. We typically receive a variety of broken items in every café. 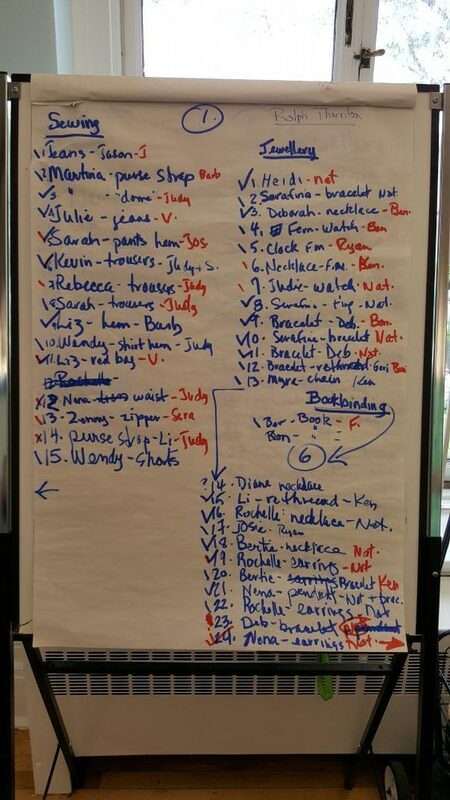 As you can see in the flip charts which were used to put our visitors into a queue, the list for household and computer items this month included vacuum cleaner, meat thermometer, speaker wire, toaster, lamp, etc. 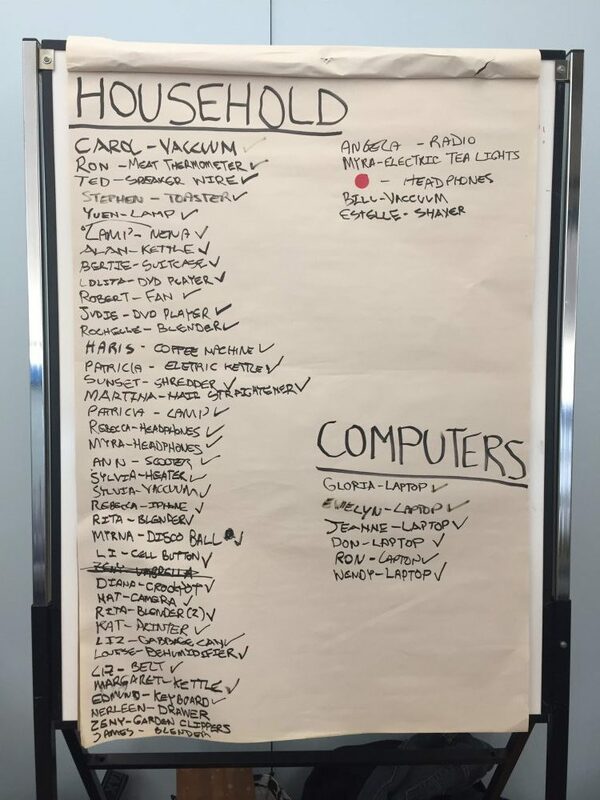 Our volunteers, Jason and Mariana, managed the flip chart for household and computer items and were responsible for matching visitors with their fixers. They also lent their hands for fixes when they could. 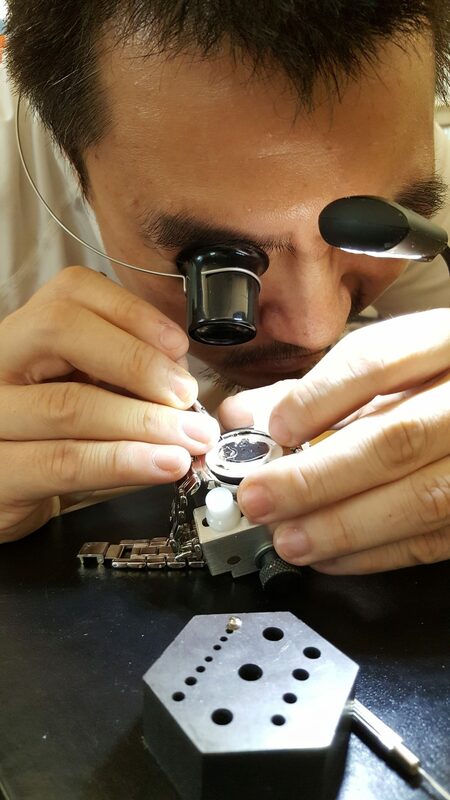 In the photo below, they help a visitor (left) sort out a troublesome cable. 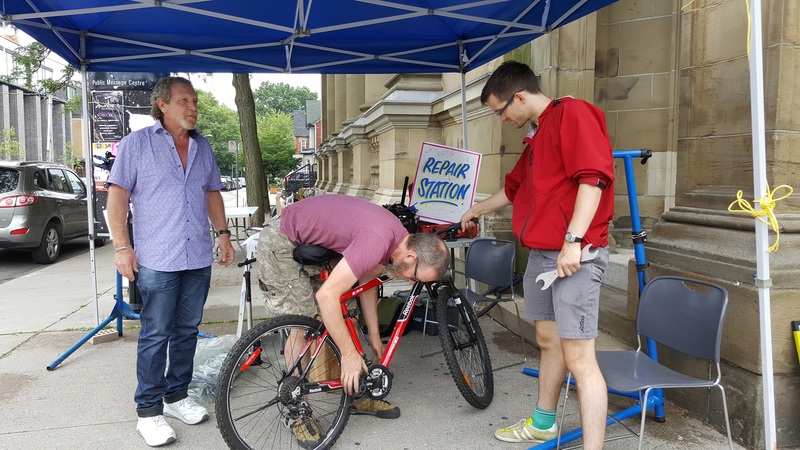 A bike repair tent was set up outside beside the main entrance. Our bike volunteer, Jeff, and BikeSaurce’s volunteer (also Jeff!) worked together and had more than a dozen bikes fixed. 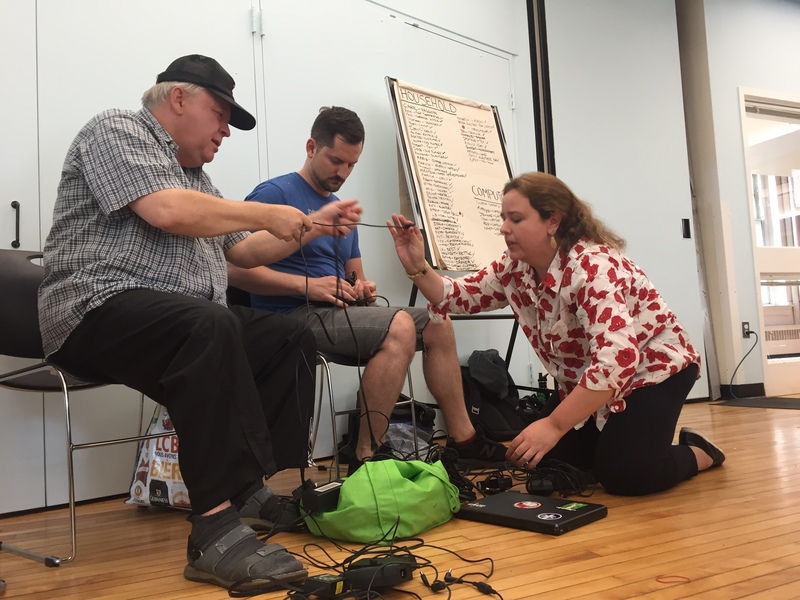 We would like to thank Ralph Thornton Centre for providing the fabulous space, and BikeSauce and Cycle Toronto for their participation. 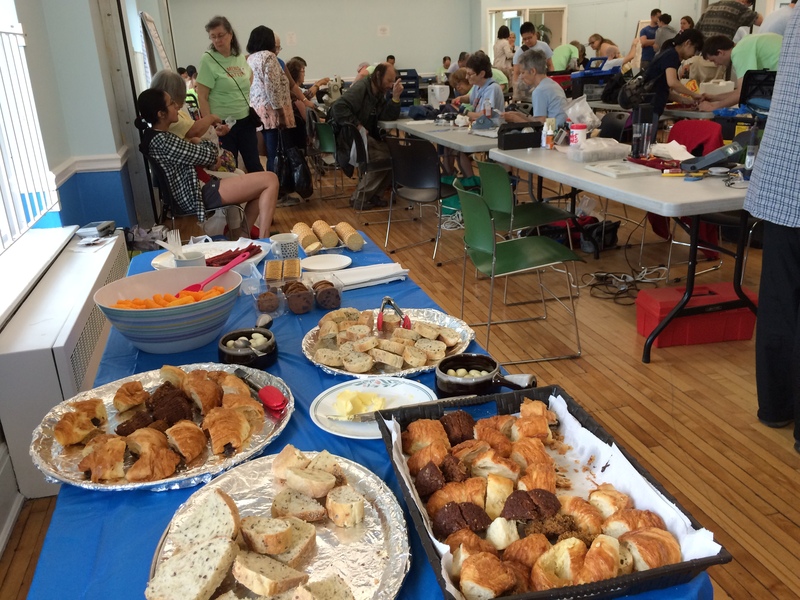 In particular, a big thank you to Queen/Saulter Public Library for all your support, from planning and promotion to providing fresh bakery and home-made lemonade throughout the 4-hour event. Thank you everyone for another great event! 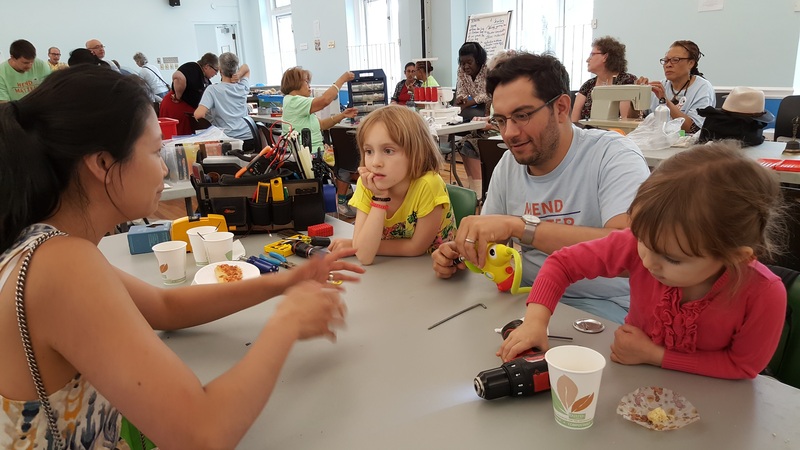 Our next full Repair Café will be held at the Albion Branch of Toronto Public Library on Saturday, August 26. 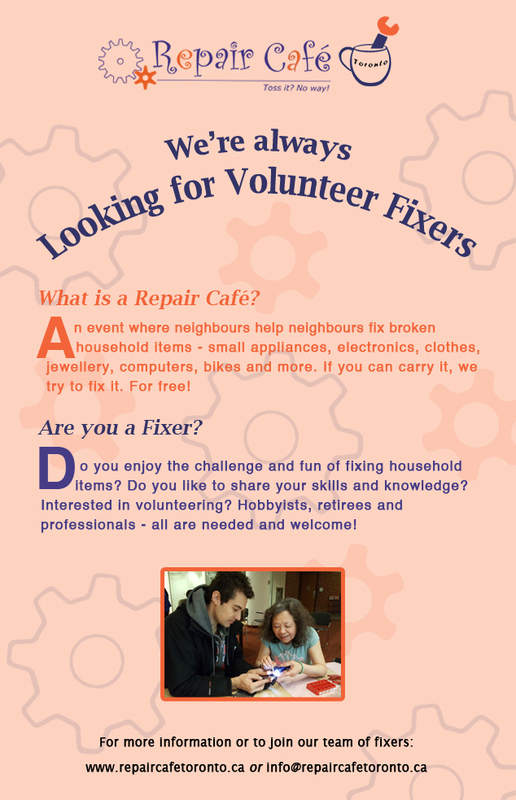 For details, please visit the Upcoming Repair Cafés page. We’re looking forward to the new renovated space. See Toronto Star’s latest piece on it!